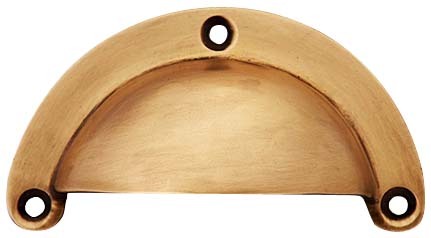 3 3/8 Inch Overall (3 Inch c-c) Solid Brass Traditional Cup Pull (Antique Brass Finish). Measures 3 3/8 inch wide and 2 inch tall with a projection of 3/4 inch. Center to Center mounting distance measures 3 inch (3.00 c-c). Comes complete with mounting hardware. Available in several finishes including polished brass, antique brass, oil rubbed bronze, polished chrome, brushed nickel, and flat black.